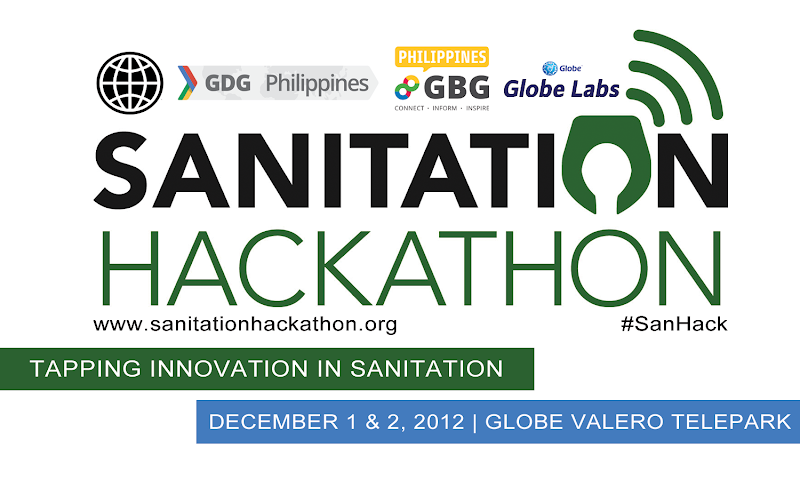 In cooperation with World Bank's Water and Sanitation Program and Blogwatch.tv; and with the sponsorhip of Globe Labs, GDG Philippines and GBG Philippines organized the Sanitation Hackathon Philippines last December 1-2, 2012. The two-day hackathon was held simultaneously in Manila and in five other cities in the country: Baguio, Bacolod, Cebu, Davao and Zamboanga. Sanitation Hackathon is a social good hackathon that aims to develop open technology for sanitation challenges. In the Philippines, there are still sanitation challenges and problem, and the hackathon aims to develop apps to overcome these challenges. The Manila hackathon was held at Globe Valero Telepark (111 Valero Street, Makati City). There were three winners per city (except Manila with only two finalist). Davao City's Team Comfort (Corden Malinao Naraga and Edith Naraga) from Davao City was judged as the grand winner. The list of all winners is available in the GDG Philippines blog post. You can also watch the video of the announcement of winners(via Hangouts on Air) here.